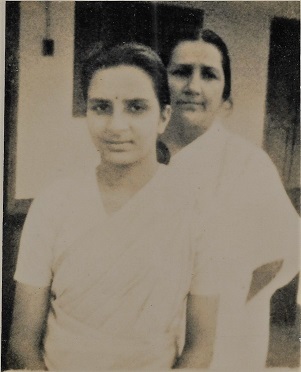 My mother, Swarna Kumari (Beena) Roy Choudhury was the daughter of Professor Rajanikanta Guha, a well-known academic in Bengal, who had been initiated into the Brahmo faith1 by Shibnath Shastri, the celebrated 19th century reformer and scholar. Rajanikanta, my grandfather (Dadu, as we called him) was a professor at Anandamohan College in Mymensing2 and then became the Principal of Brojomohan College in Barisal3. Moving to Calcutta, he became a professor in the University of Calcutta, and later took up the position of the Principal of City College. Rajanikanta was an Acharya (or Minister) in the Sadharan Brahmo Samaj4 and instilled in his three children, the significance and relevance of the principles of Brahmoism and this, I believe, helped my mother evolve as a good person; she devoted her life to working for the larger interests of society. 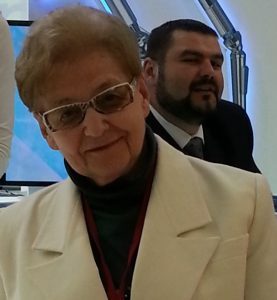 Beena was strong-willed, committed, honest, soft-spoken person, with amazing qualities of leadership. 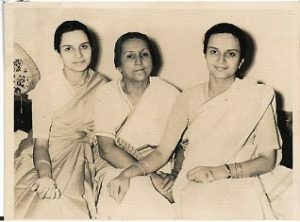 She was the first woman in Calcutta University to earn a post graduate degree (M.A) in Mathematics. Apart from her father, her mentor was none other than Sir Ashutosh Mukherjee5. Beena started her career as the Vice-Principal of Kamarunissa School and College in Dhaka and then moved to the Girls’ College in Bankura6. She became the Principal of Lady Keane Girls’ College in Shillong7 and finally the Principal of Beltala Girls School in Calcutta. She died in harness, having served the institution for 17 years. I wish to relate two incidents in my mother, Beena’s life that reflect the kind of person she had been. The first was recounted at her memorial service by Abanti Shastri, the daughter in law of Shibnath Shastri. Ma never told us about this. The year was 1936-37 in Dhaka. The British inspector of the College Board was informed that a few teachers of the Kamarunissa School and College, had recently attended a public meeting of the Swadeshis8. The lady in question wanted the names of the teachers who had attended the public protest rally against the colonial government, determined to sack them from employment in the College. 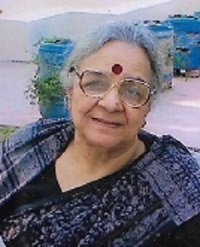 The Principal, Sujata Roy, (a Brahmo and wife of scientist, Dr. Satyen Roy) replied immediately that all the teachers of the College, including herself, had attended the meeting. Furious at her response, the lady decided to remove Sujata Roy from office, with the help of a few others; meanwhile, she succeeded in stopping government financial assistance to the College. Beena came know of this and immediately set about declaring open war against the British administration. Along with her husband, my father, Dr. Pradosh Chandra Roy Chowdhury, she convened a series of public meetings to inform guardians, students, teachers and members of the general public about the unfairness of the incident. Such an initiative taken by a single lady was so unprecedented that it took all by surprise; but people responded with enthusiasm in favour of the cause. The member was asked to leave, a new committee was formed and government aid restored; all this while there was still British regime. After a pause he exclaimed, ‘You didn’t recognise me Didi, did you? I am Tutu!’ Suddenly, a veil of mist lifted and I looked back to a distant past to see a small child of one and a half years old in my lap with Ma sitting next to me. I was thrilled to see Tutu, now a handsome young Army Captain of the Indian Army, with a boy of his own. Sabita, a teacher in Beltala School whose husband deserted her with five young children between the ages of 15 and 1 and a half had been suffering from an advanced stage of tuberculosis. As she lay dying, the hapless, lonely lady remembered the much respected and kind, Beenadidi to whom she handed over her children and soon after, passed away peacefully. Ma took charge of all the five children in earnest and took care of them till she found foster homes for three of them; she decided to take care of the youngest two. Each time, a child was taken away for adoption, Ma would say a brief prayer to God: ‘Please look after this motherless child. I hope I am not making a mistake.’ For Tutu, who was the youngest, she decided that until a good home with very loving and supportive parents was found, he would stay with us. Eventually, she was informed that a well-to-do childless couple in a village some distant away from Calcutta, was looking to adopt a son. After proper enquiry and having been fully satisfied with what she found out, Ma let the couple come and take Tutu back with them and they did so very eagerly. Tutu’s going away broke my heart and I was miserable. This was in the 1950s. Tutu had spent close to a year with us in Ballygunge and returned about 30 years later in 1985. Even though his memory of Ma had faded and he couldn’t quite remember her, he was truly grateful for his upbringing and wished to thank God standing before the picture of one who he felt, had been his true saviour. Ma was after all right in choosing the wonderful family for Tutu. All the children of Sabita’s, except one who died young, grew up well and had successful lives and careers. It was Ma’s hard work and her faith that saved this family from devastation. She belonged to a generation of Brahmos known for their dedication, sense of responsibility, commitment and love of humanity. I feel, my sister and I have little talent to match the stature and brilliance of Ma. I also feel that perhaps we did not appreciate, as much as we should have, her presence in our lives though we were very proud of her and thankful for being her daughters. She died at the age of 61 in 1962.